Andrei Melnichenko has extra reason to be concerned about the sunlight — and we aren’t talking financial transparency. The owner of Eurochem, a large Russian producer of fertilizers, says he has evidence that sunlight on his surfaces reveals rash, blotches, separations, lines, starring and sagging. He says he’s paid to see his face reflected on the surfaces, but because the job has been botched, he can’t. The damage he is estimating at $100 million. That’s not Melnichenko’s person we are talking about, but the surfaces of his boat, a motor yacht named A, after his wife Alexandra, and owned by the two of them through a succession of offshore companies, starting with Niedes Ltd. of British Virgin Islands, A Yacht Charter Co. of Isle of Man, and currently Bermuda Yachts Ltd of Bermuda. The case docket, No. L002634-10, in the Superior Court of New Jersey commenced with Melnichenko’s claim dated July 8, 2010. By late last month, it was running to 116 filings. Altogether, the file holds 260,000 pages, including 300 exhibits, 27 witness depositions, and dozens of contracts. So far it has cost both sides several million dollars. It is the biggest product liability claim ever made by a Russian against an international supplier. More detail on the Awlgrip-brand paint, and on what Mr and Mrs Melnichenko have claimed about themselves in the court papers, were sealed this past July by the presiding judge, Kenneth Grispin, on the ground that they may contain trade and commercial secrets for the paint company, and privacy issues for the Melnichenkos. Still, the case is lifting the lid, so to speak, on what happens when an oligarch’s toy doesn’t play as he expects. It’s not the first from Mr and Mrs Melnichenko. Their lawsuit over a sculpture which turned out to be too short for their backyard — by 100 centimetres — was pursued for €5 million, but settled after eight months without judgement and without damages. This time the proceedings are already at the three-year, three-month mark, and the claim, as itemized by the Melnichenkos’ lawyers, is for more than $100 million. The shipbuilder, Blohm & Voss, is being sued separately and elsewhere for €13 million. 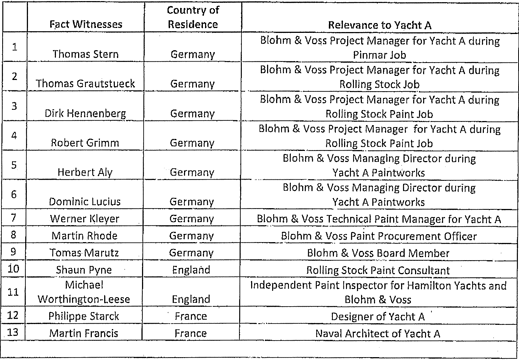 The Akzo Nobel defence documents argue that painting a yacht is a “complex process and requires, among other things, the appropriate environment, necessary equipment, and highly skilled and experienced applicators”. But they categorically deny product defects, negligent painting, or fraudulent warranties. As for the biggest item in the Melnichenkos’ bill, the cost of a boat for them to sail about while Yacht A is laid up for repainting, a source close to the case calls the 18-month period “nonsense”. In the court papers it is argued “Plaintiff has suffered no compensable damages”. According to International Paint LLC, the New Jersey company which is immediate target of the court action, the Melnichenko claim is misdirected. If the paint job turned out to be as non-reflective as the Melnichenkos are claiming, the alleged damages “if any, were not the result of any act or omission on the part of International Paint LLC, but exist by reason of operation of nature over which International Paint LLC had no control.” In short, Mother Nature is to blame. Or to be specific, Aeolus, God of the sea winds, Briareus, God of the sea storms, Oeolyca, in charge of sea waves, the Harpies (gusts and water spouts), not to mention Poseidon, God of all the sea. The court record reveals an uncharacteristic reluctance on the part of Melnichenko’s wife Alexandra to put her mouth where her husband’s er, lawsuit is. In September of this year, according to one of the filings by lawyers for the Akzo Nobel group, the court was told that Mrs Melnichenko had been notified that she should appear for a deposition in the spring of 2012. It then took the paint group almost a year to compel her to appear. “Despite her clear importance to this case, Plaintiff refused to produce Mrs Melnichenko – forcing Defendants to move to compel her production for deposition”. The compel order was filed in August of 2012. Mrs Melnichenko finally gave her deposition to the defence lawyers on February 12, 2013. That document, plus Andrei Melnichenko’s earlier witness statement, are among the documents sealed by the court. Akzo Nobel is also accusing the Melnichenkos’ lawyers of withholding another dozen witnesses whose testimony, the company says, is required for the court to adjudicate the claims, including Philippe Starck, the designer of the exterior shape and interior decoration of the boat. According to the defence lawyers, the Melnichenko side “has not only refused to make these witnesses available but has also opposed Defendants’ efforts to depose them”. 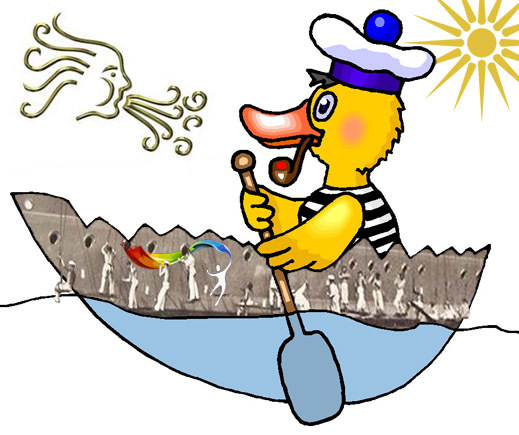 Before any of these claims can be adjudicated, the New Jersey courts must decide whether they should exercise jurisdiction to hear the case, as Salisbury, the Melnichenko lawyer, is insisting; or whether, according to the Akzo Nobel group, the courts of Germany or England are the proper forum – Germany, because that’s where the boat was built, and where it and a 10-tonne mock-up of Melnichenko’s boat were painted; England, because that’s where all but two of the components in the Awlgrip-branded paint used on the boat were fabricated, and where the paint experts are located. In a judgement issued on October 22, Judge Grispin decided there is something to be said on both sides. He agreed that “either Germany or England is an adequate alternative forum to New Jersey”. On the other hand, he agreed the expense of moving the case into the German or English courts would be enormous, and that the Akzo Nobel lawyers “have not met the burden of overcoming the presumption against dismissal”. On that triple-negative, and in the absence of a compelling argument either way, Grispin ruled that his court should keep jurisdiction, and the case should proceed. Akzo Nobel has yet to register whether it will appeal this ruling, or go to trial.